During the school holidays the children are able to come for full, half days, short days or a.m/p.m. 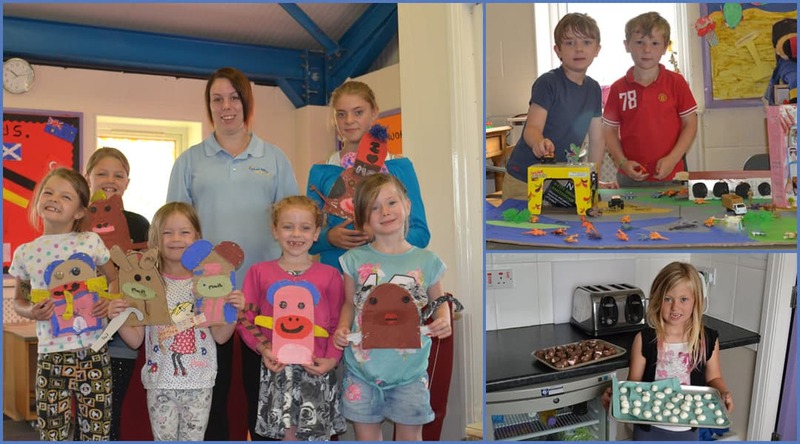 sessions where they can take part in a wide range of planned activities, some of which include ‘wacky hair day, clay modelling, tent/den building, baking and cooking activities’ also trips to the seaside or other attractions and walks to the local parks and nature reserves. Our holiday club is open all the school holidays except the week between Christmas and New Year and official bank holidays. Your children don’t need to have attended the out of school club or day nursery to take part in any of these holiday club activities and the same FLEXIBILITY applies here as with the rest of Blue Sky in that you can book as many or as few sessions as you and your child wish. From as little as 1 hour to 1 afternoon, 1 day or a few days a week to as much as every day during the holiday. There is always something to do and someone to play with in Blue Sky holiday Club.